A 23-year-old man from New York City and a 32-year-old New Jersey man were among the eight people killed when a truck sped through a Manhattan bike lane for more than a dozen blocks in an apparent ISIS-inspired attack, police say. Darren Drake, of New Milford, was riding his bike during a 15-minute break from his program manager job at Moody's Analytics when the truck plowed into crowds of pedestrians and riders on a popular Tribeca bike path Tuesday. Drake, a graduate of Rutgers pursuing a second master's at Stevens Institute of Technology, also served four years on the New Milford Board of Education, holding the vice president chair for two of them. He didn't yet have children of his own, but was hoping to one day. "He had everything going for him," Drake's father, Jimmy Drake, told News 4, as he started sobbing. The other American victim was identified by police as Nicholas Cleves, of Manhattan. The software engineer and web developer lived on Greenwich Street in the West Village, where stunned neighbors said he was a smart, friendly young man with an adventurous spirit. New Jersey man Darren Drake was on the brink of success, his parents say. But his life was taken from him by a terrorist attack in New York City on Tuesday. Jen Maxfield reports. "This is an absolutely lovely young man," said a neighbor named Dianne, who declined to give her last name. "The type of person every parent hopes theirs grows up to be." Cleves was "smart, funny, kind, engaged," she said. "He was a Village kid and everyone in the store knew him and loved him," said Dianne. "There have been more tears shared in this store than ever." A family friend later Wednesday said that Cleves was a "fine young man." Online profiles show he went to Elisabeth Irwin High School in New York City and graduated last year from Skidmore College with a degree in computer science. An only child who was living with his mother, he had been working as a software engineer for the Unified Digital Group. Cleves described himself on his Facebook page as a "nerdy white boy." The most recent photo posted there showed him posing with some friends next to a Darth Vader figure at Star Wars exhibit. 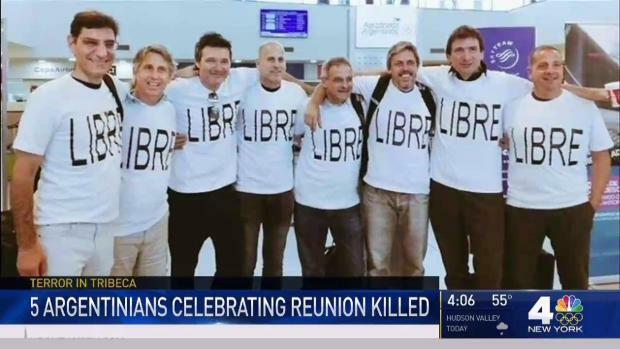 Five Argentines celebrating a college reunion were among those killed in a terrorist attack in lower Manhattan on Tuesday. Andrew Siff reports. Outlining his aspirations on LinkedIn, Cleves wrote that he was "searching for ways in which technology can be used to make positive impacts on our everyday lives." In a statement Wednesday, Skidmore College president Philip Glotzbach said Cleves was a IT assistant, astronomy tutor and son of a Skidmore graduate. "At moments such as these, we realize anew how powerless are our words in the face of profound grief, Glotzbach said. "Even so, we reach out to offer our thoughts and prayers, along with the hope that knowing that others are also touched by this loss may provide at least some small measure of comfort." In New Jersey, Drake had recently undergone weight loss surgery and was riding his bike 25-plus miles a day to stay fit, his father says. An only child, he lived with his parents; his father said he drove him to the Hoboken train station each morning. His parents knew something was wrong when their conscientious son was late for dinner and didn't call. "Five-fifteen, 5:30, 5:45, 7. My wife said, 'Jimmy, that's it, we need to go to the hospital," Jimmy Drake said. "If there was one guy a terrorist was going to kill, it wouldn't be my son," he said. "He wouldn't swat a fly." Jimmy said he will give his son's bike to charity, and his own, too, now that his only child is gone. "I'll give it to some kid who needs it -- and give him my bike, too, I'm not riding it," he said. The New Milford Board of Education said in a statement, "A board member in high esteem, Darren was a good man with a soft touch and huge heart. He is respected for his unwavering commitment to the children of New Milford and their education." Drake had cheated death before, missing the Hoboken train crash last year by just minutes and staying at the Mandalay Bay Hotel just weeks before the Las Vegas massacre. His employer Moody's said he was a valued member "and his loss will be deeply felt by all those who worked with him." The other six fatalities included five Argentinians celebrating a graduation anniversary and a 31-year-old Belgian national, Anne Laure Decadt. Six of the victims died at the scene; the other two died at hospitals. "We now and forever will consider them New Yorkers. They shared this tragedy with us and for that we will always remember them as New Yorkers," Mayor de Blasio said Wednesday of the foreigners killed in the attack. Decadt was a mother of two, including a baby, according to the New York City Belgium Consulate General. She was riding bikes with her mom and two sisters when she was mowed down from behind; she died at New York Presbyterian Hospital. The rest of her family was injured. A second Belgian family of four was also injured in the attack. 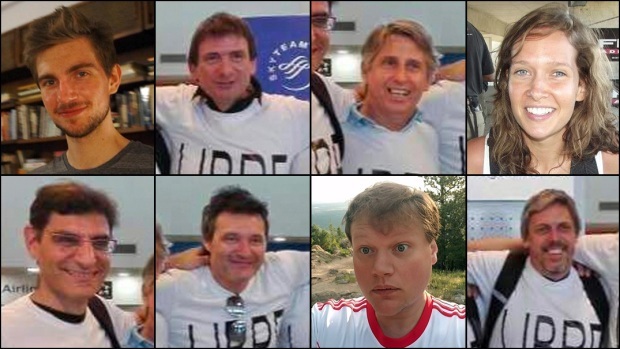 Argentinian nationals Hernán Mendoza, Diego Angelini, Alejandro Pagnucco, Ariel Erlij and Hernán Ferruchi, most of them architects, were having a 30-year reunion after graduating from the Polytechnic School of Rosario. The five dead were among a group of 10 friends marking their graduation with a tour of New York and Boston, where at least one survivor of the group lived. They had gone on a bike ride through Central Park on Tuesday before turning south, to lower Manhattan. "They were pedaling in lines of two, chatting, laughing, enjoying the ride. My husband was the last one in the line, when he felt a speeding car, and then the truck that zoomed by" at high speed, Cecilia Piedrabuena, the wife of survivor Ariel Benvenuto, told an Argentine radio station. "The truck took away his friends, and he saw them all scattered on the ground." Benvenuto called his wife and said, "Honey, this is very serious. It's a terrorist attack," she recalled. "An hour later, he called me and told me that his friends had died." Mendoza was an architect and father of three who designed the home of his close friend, Estanislao Beas. "The news destroyed my wife and I," Beas said. "We had a tight bond. We cared for him so much. It's incredible that this happened to him and that he was there at that time." The reunion trip was partially financed by Erlij, the chief executive of Ivanar, an Argentine steel products manufacturing company, according to Argentina's La Nacion newspaper. "It hurts us to think that these are people who walked the same school halls as we did or that studied in our same classrooms," said Agustin Riccardi, a senior at the school. 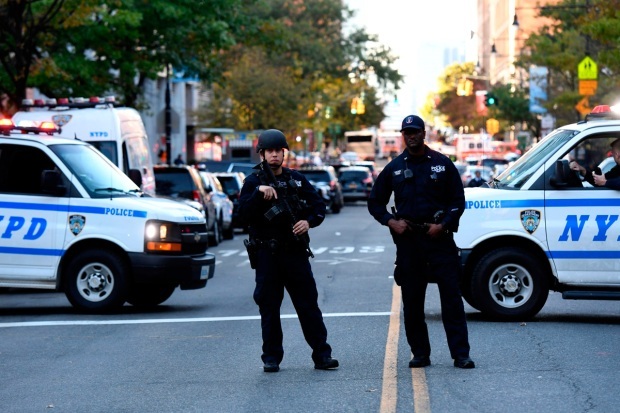 Twelve other people were hurt in the truck rampage, an attack authorities have described as the worst terror attack to hit New York City since 9/11. Authorities detailed gruesome injuries to some of those survivors, ranging from bilateral amputation to serious head, neck, back and chest trauma, as well as trauma to their arms and legs. Five of the dozen sent to hospitals were in serious condition Wednesday; four were in critical but stable condition and three went home. Of the survivors, two victims were students and two were employees on the school bus the suspect smashed into along his route of terror. The German government says a German citizen is among the injured. The Foreign Ministry didn't identify the female German citizen or give any details about the severity of her injuries in a note on its website. A sixth Argentinian who lives in Newtown, Massachusetts, is also among the injured. Investigators said Wednesday that the suspect, 29-year-old Sayfullo Habibullaevic Saipov, had planned the attack for weeks. He was shot by police as he ran through traffic with pellet and paintball guns but is expected to live.